The aircraft was shot down by Russian Buk from militant-controlled territory. The Joint Investigative Team said the flight MH17 by Malaysia Airlines was downed by Buk missile system, brought from Russia to the territory controlled by the "DNR" militants, the Ambassador of Ukraine to the Netherlands Oleksandr Horin said on Channel 112 Ukraine. "During a briefing for the relatives of those who died in this tragic event, it stated in no uncertain terms that the flight was shot down by a Buk missile, which came from the territory of the Russian Federation and had been withdrawn to the territory of the Russian Federation after the event. It was deployed on the territory, controlled by pro-Russian separatists in the area of Pervomaiske," the diplomat said. The same town was mentioned in the intercepted by the SBU telephone conversations of separatists as a place of redeployment of Buk complex. Pervomaiske and Pervomaysk are two villages in the vicinity of Snizhne. JIT investigators said that Ukraine was fully cooperative in the investigation, and "if not for Ukraine, the investigation would have not been able to move that far." The investigation has yet identified the individuals who gave orders and pushed the button, but the number of suspects exceeds 100 people. The chief prosecutor of the Netherlands Fred Vesterbeke said that the investigation from the outset has excluded two versions of the catastrophe - a technical failure or terrorist attack inside the liner. Regarding the version according to which the MH17 was downed by other aircraft, Vesterbeke said that any other aircraft has not been noticed near Boeing. Vesterbeke stressed that the data of Russian radar systems indicate the same. "First of all, the investigation team has ruled two possible scenarios - accident and terrorist attack inside the plane, and then focused on the scenario of the downing of the Boeing by another plane. This version has also been discarded, based on radar data provided by Russia, Ukraine and the analysis of aircraft negotiations with the dispatchers on the ground. Therefore, the investigation claims that MH17 was shot down from the ground,"- said the chief prosecutor of the Netherlands Fred Vesterbeke. Next, the investigators demonstrated the recording of intercepted telephone conversations made on July 16-17, in which two people in Russian say that Buk has been brought from Russia to the territory controlled by the separatists. "The materials of the criminal case show that the flight MN17 was downed on July 17, 2014 by 9M38 series rocket, which was launched from Buk missile system, and that the complex has been brought from the territory of the Russian Federation and then returned to the Russian Federation," a representative of the Joint Investigative Team told the press conference in the Netherlands. The investigation examined the version. According to which the rocket was launched from the village of Zaroshchenske, suggested by Russia. The investigation team had found trace of a launched. In addition, the area was also controlled by the separatists. The investigation concluded that the launch of the Buk missile that downed the aicraft, was made from a territory in the vicinity of Snizhne, Pervomaiske district, which also found evidence by on-site work, proved by the data provided by the US and the European Space Agency. "The investigation team believes that the launch of Buk was made with the farm field, located outside the village of Snizhne, which was under the control of separatists. The site of the rocket launch was under control of militants. This is also evidenced from the US data, which estimated that the location of the launch was 6 km south of Snizhne," said the head of the central Department of Criminal Investigation of the National Police of the Netherlands Wilbert Paulissen. The journalist were shown two photographs of the field near Pervomaiske taken between 16 and 18 of July. The second image features a piece of parched land. There was no photos made on 17 July, because it was cloudy that day. The investigation has no doubts that the rocket launch occurred near Pervomaiske. The investigators came to the conclusion the disaster was caused by a missile fired from Buk by examining the wreckage and dead bodies. The commission has shown 3D-reconstruction of the disaster. Also, the investigation carried out a controlled explosion on the ground to understand how a missile destroys nearby objects. To determine the path of the rocket launcher, the commission has studied the call logs of the towers that receive signals from mobile phones of the crew that accompanied the Buk. Many eyewitnesses saw the system being delivered from Russia. Such videos would appear on social networks, say the representatives of the commission. Investigation materials show that Buk was accompanied by the Russian military on its way to Pervomaiske. To trace the route of Buk after the launch of the missile, the commission has studied the phone calls of the convoy and the data from cell towers. Initially, the system was taken to Luhansk, and then back to Russia. The records of intercepted phone calls indicate that by 18 July the system was trucked from the territory of Ukraine. The Joint Investigative Team then proceeded to publicize the conclusions about who is to blame for the crash. In all, the commission said it had about a hundred suspects. Among them are those who organized the convoy of rocket launcher and gave orders. However, the investigation has not yet established whether the Buk crew acted on orders or on its own initiative. The investigation was extended until the beginning of 2018. As the floor was given to representatives of each country involved in the probe, the deputy Prosecutor General of Ukraine Dmytro Storozhuk pointed out to Ukraine's contribution to the investigation including intercepted phone conversations, videotapes and other evidence. Ukraine has done anything possible for the success of the investigation, he said. The representative of the Netherlands stressed that not all the evidence has been shown, but it will be produced "in due time". When asked by a reporter why the JIT team did not investigate the fact that Ukraine has not closed its airspace over the place of the disaster, Vesterbekke responded such a task was not on his team's agenda. On the question of when and where the trial would take place, a representative of investigation responded that all the details about the trial will be made public only after all the perpetrators in the case are established. The chief prosecutor of the Netherlands Fred Vesterbeke reiterated that he considered the evidence as conclusive. According to him, the investigation has narrowed the range of suspects to 100 individuals who one way or another may be implicated in the downing of the Boeing. He declined to directly accuse Russia or any specific Russian citizens of the disaster, but said the chances to pinpoint those responsible for the accident were very high. 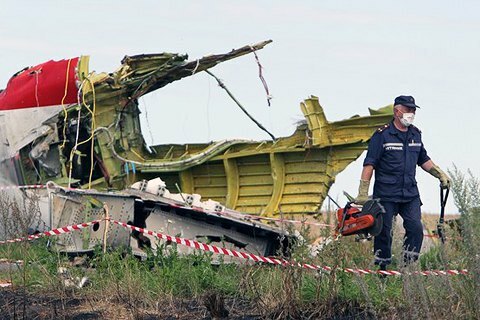 The Boeing-777 Amsterdam-Kuala Lumpur flight was shot down over eastern Ukraine on July 17, 2014, killing all 298 people on board, including 196 Dutch citizens. The tragedy killed all 298 people aboard. Passengers of the flight were citizens of 10 countries, the majority of victims (196) - the citizens of the Netherlands.